The army is under civilian control, with the Grand Duke as Commander-in-Chief. The Minister for Defence, currently François Bausch, oversees army operations. The professional head of the army is the Chief of Defence, who answers to the minister and holds the rank of general. Luxembourg has participated in the Eurocorps, has contributed troops to the UNPROFOR and IFOR missions in former Yugoslavia, and has participated with a small contingent in the current NATO SFOR mission in Bosnia and Herzegovina. Luxembourg troops have also deployed to Afghanistan, to support ISAF. The army has also participated in humanitarian relief missions such as setting up refugee camps for Kurds and providing emergency supplies to Albania. On 8 January 1817, William I, Grand Duke of Luxembourg, published a constitutional law governing the organization of a militia, the main provisions of which were to remain in force until the militia was abolished in 1881. The law fixed the militia's strength at 3,000 men. Until 1840, Luxembourg’s militiamen served in units of the Royal Netherlands Army. Enlisted men served for five years: the first year consisted of active service, but during each of the subsequent four years of service they were mobilised only three times per year. In 1839, William I became a party to the Treaty of London by which the Grand-Duchy lost its western, francophone territories to the Belgian province of Luxembourg. Due to the country's population having been halved, with the loss of 160,000 inhabitants, the militia lost half its strength. Under the terms of the treaty, Luxembourg and the newly formed Duchy of Limburg, both members of the German Confederation, were together required to provide a federal contingent consisting of a light infantry battalion garrisoned in Echternach, a cavalry squadron in Diekirch, and an artillery detachment in Ettelbruck. In 1846, the cavalry and artillery units were disbanded and the Luxembourg contingent was separated from that of Limburg. The Luxembourg contingent now consisted of two light infantry battalions, one in Echternach and the second in Diekirch; two reserve companies; and a depot company. In 1866, the Austro-Prussian war resulted in the dissolution of the German Confederation. Luxembourg was declared neutral in perpetuity by the 1867 Treaty of London, and in accordance its fortress was demolished in the following years. In 1867, the Prussian garrison left the fortress, and the two battalions of Luxembourgish light infantry entered the city of Luxembourg that September. A new military organization was established in 1867, consisting of two battalions, known as the Corps des Chasseurs Luxembourgeois, having a total strength of 1,568 officers and men. In 1868, the contingent came to consist of one light infantry battalion of four companies, with a strength of 500 men. On 16 February 1881, the light infantry battalion was disbanded with the abolition of the militia-based system. Soldiers of the Corps des Gendarmes et Volontaires pose for a photograph, 1910. On 16 February 1881, the Corps des Gendarmes et Volontaires (Corps of Gendarmes and Volunteers) was established. It was composed of two companies, a company of gendarmes and one of volunteers. 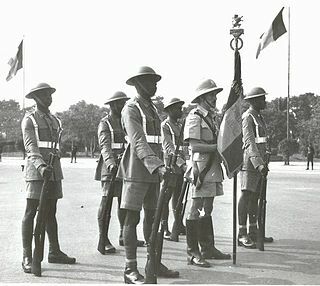 In 1939, a corps of auxiliary volunteers was established and attached to the company of volunteers. Following the occupation of Luxembourg by Germany in May 1940, recruitment for the company of volunteers continued until 4 December 1940, when they were moved to Weimar, Germany, to be trained as German police. 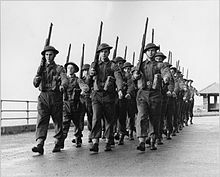 Luxembourg troops training in an English seaside town in 1943. In 1944 during World War II, the Luxembourg Government, while exiled in London, made agreements for a group of seventy Luxembourg volunteers to be assigned to the Artillery Group of the 1st Belgian Infantry Brigade, commonly known as Brigade Piron, Jean-Baptiste Piron being the chief of this unit. This contingent was named the Luxembourg Battery. Initially, it was built up and trained by two Belgian officers. Later, from August 1944, these were joined by Luxembourgish officers, who had received training in Britain. Several Luxembourgish NCOs and half of the country's troops had fought in North Africa in the French Foreign Legion. The rest were people who had escaped from Luxembourg, and young men evading forcible conscription into the Wehrmacht by fleeing to Britain. The Luxembourg unit landed in Normandy on 6 August 1944—at approximately the same time as the Dutch Princess Irene Brigade and the French 2nd DB ("division blindée") commanded by General Leclerc—two months after the D-Day landings. The Luxembourg Battery was equipped with four Ordnance QF 25 pounder howitzers, which were named after the four daughters of Grand Duchess Charlotte: Princesses Elisabeth, Marie Adelaide, Marie Gabriele and Alix. In 1944, obligatory military service was introduced. In 1945, the Corps de la Garde Grand Ducale (Grand Ducal Guard Corps) garrisoned in the Saint-Esprit barracks in Luxembourg City and the 1st and 2nd infantry battalions were established, one in Walferdange and the other in Dudelange. The Luxembourg Army took charge of part of the French zone of occupation in Germany, the 2nd Battalion occupying part of the Bitburg district and a detachment from the 1st Battalion part of the Saarburg district. The 2nd Battalion remained in Bitburg until 1955. Luxembourg signed the Treaty of Brussels in March 1948, and the North Atlantic Treaty in 1949. Setting up an army after the war proved more difficult than predicted. To a certain extent, the authorities could rely on escaped German conscripts and Luxembourgers who had joined Allied armies; however, they had to find a way to train officers. Initially, British military advisers came to Luxembourg, where training was carried out by British officers and NCOs. But officer training, in the long term, would have to be done in military schools abroad. Belgium and France were both interested in helping and offered solutions. In the end, the government opted for a compromise solution, by sending some officer cadets to the École spéciale militaire de Saint-Cyr in France and others to the Royal Military Academy in Belgium. This eventually led to disunity within the Luxembourg officer corps due to differences in training and promotion. In 1951, the Grand Ducal Guard relocated to Walferdange and integrated with the Commandement des Troupes. The Guard had special units for reconnaissance, radiac reconnaissance, and anti-air warfare. From 1955, it was organised into a headquarters company, a garrison platoon, a reconnaissance company and two training companies. In 1959, the Commandement des Troupes was disbanded and the Grand Ducal Guard was integrated into the Commandement du Territoire (Territorial Command). The force was reduced to a single company, a corporals' training school, and a weapons platoon. In 1960, the Grand Ducal Guard was again reorganised into four platoons, temporarily grouped into intervention and reinforcement detachments. In 1964, the Grand Ducal Guard was organized into a HQ, three platoons, a reinforcement platoon, and the NCO school. On 28 February 1966, the Grand Ducal Guard was officially disbanded. A Luxembourgish soldier in Korea, 1953. In 1950, seventeen countries, including Luxembourg, decided to send armed forces to assist the Republic of Korea. The Luxembourg contingent was incorporated into the Belgian United Nations Command or the Korean Volunteer Corps. The Belgo-Luxemburgish battalion arrived in Korea in 1951, and was attached to the US 3rd Infantry Division. Two Luxembourger soldiers were killed and 17 were wounded in the war. The Belgo-Luxembourgish battalion was disbanded in 1955. In 1954, the Groupement Tactique Régimentaire (GTR) (Regimental Tactical Group) was established as Luxembourg’s contribution to NATO. It consisted of three infantry battalions, an artillery battalion, and support, medical, transport, signals, engineering, heavy mortar, reconnaissance, and headquarters companies. The GTR was disbanded in 1959. In addition to the GTR, the Army also included the Home Command, composed of headquarters, military police, movement and transportation companies, a static guard battalion, and a mobile battalion. In 1961, the 1st Artillery Battalion was placed at NATO's disposal. The battalion was organised into three batteries, each with six 105 millimetres (4.1 in) field howitzers (British 25 pounder guns converted to 105 mm caliber) from the former GTR artillery battalion, an HQ battery, and a service battery. In 1963, the battalion was attached to the US 8th Infantry Division. In 1966, the Grand Ducal Guard was disbanded and its tasks were transferred to and performed by the 1st Artillery Battalion until it too was disbanded, in 1967. Compulsory military service was abolished in 1967 and the 1st Infantry Battalion was established, consisting of a headquarters and services unit, two motorized infantry companies, and a reconnaissance company with two reconnaissance (recce) platoons and an anti-tank platoon. From 1968 onwards, it formed a part of NATO’s ACE Mobile Force (Land) (AMF(L)). In 1985, a reinforced company—consisting of an AMF Company with two recce platoons and an anti-tank platoon, a forward air-control team, a national support element for logistics, and a medical support element—replaced the battalion. In 2002 the AMF(L) was dissolved. Luxembourg has participated in the Eurocorps since 1994, has contributed troops to the UNPROFOR and IFOR missions in former Yugoslavia, and has participated with a small contingent in the current NATO SFOR mission in Bosnia and Herzegovina. The Luxembourg army is integrated into the Multinational Beluga Force under Belgian command. Luxembourg troops have also deployed to Afghanistan, to support ISAF. Luxembourg financially supported international peacekeeping missions during the 1991 Persian Gulf War in Rwanda and, more recently, in Albania. The army has also participated in humanitarian relief missions such as setting up refugee camps for Kurds and providing emergency supplies to Albania. Luxembourgish soldiers during National Day. The army is under civilian control, with the Grand Duke as Commander-in-Chief. The Minister for Defence, currently Etienne Schneider, oversees army operations. The professional head of the army is the Chief of Defence, currently Romain Mancinelli, who answers to the minister. The Grand Duke and the Chief of Defence are the only generals, with colonels as Deputy Chief of Defence and head of the Military Training Centre. The Luxembourg Army is a battalion-sized formation with four separate compagnies (companies) under the control of the Centre Militaire (Military Centre), located in the Caserne Grand-Duc Jean barracks on Herrenberg hill near the town of Diekirch. Luxembourg has no navy, as the country is landlocked. It has no air force either, although it does have aircraft. Compagnie A, the first of two rifle companies that forms the Luxembourg contingent of the Eurocorps, is normally integrated into the Belgian contribution during operations. As such, it participates in Eurocorps' contribution to the NATO Response Force (entire company) and the EU Battlegroups (one platoon). The company consists of a command element and three reconnaissance platoons of four sections each, plus a command section. Each section is equipped with two armoured M1114 HMMWVs, each armed with a .50 caliber M2 Browning machine gun. The command section has a MAN X40 truck in addition to its pair of HMMWVs. Level B - is open to all soldiers at the end of their first eighteen months of service. Soldiers follow two six-month periods of tuition in both general and military-based subjects prior to taking examinations. Upon gaining 75% pass marks, they can proceed to the next level. Level A - is open to soldiers who have achieved the required passes at Level B, or who have attained the equivalent in civilian life prior to their enlistment. Soldiers do a single six-month period of tuition in the same subjects as Level B, but for a longer period each week. This company is also responsible for the army's Elite Sports Section, reserved for sportsmen in the Army. Following their basic training, these soldiers join the Section de Sports d'Elite de l'Armée (SSEA). Compagnie D is the second rifle company – it provided Luxembourg's contribution to NATO's ACE Mobile Force (Land) (disbanded in 2002) as the Luxembourg Reconnaissance Company. Luxembourg's participation in various UN, EU, and NATO missions is drawn from Compagnie D, which mirrors Compagnie A in organisation, with a command element and three reconnaissance platoons. Luxembourg has two reconnaissance platoons, declared to NATO's Allied Mobile Force. They are typically referred to as Elite Forces, rather than Special Forces. The Grand Ducal Police has the Unité Spéciale de la Police. 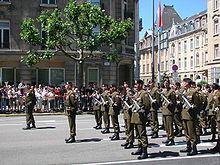 Luxembourg military uniforms are similar to British uniforms, consisting of dress, service or garrison, and field uniforms, often worn with a black beret. Dress uniforms are worn mostly on formal occasions, while service uniforms are worn for daily duty. Luxembourg Army uniforms consist of service and field attire for summer and winter, as well as a dress uniform and mess jacket for officers. The winter service dress uniform, of olive drab wool, consists of a single-breasted coat having patch pockets with flaps, a khaki shirt and tie, and trousers that are usually cuffless. The summer uniform is similar, but made of light tan material. Combat uniforms in olive-green, khaki-drab, or woodland camouflage pattern, worn with the United States PASGT helmet, are virtually indistinguishable from those worn until the 1990s by the United States Army. In 2010 Luxembourg adopted their own camouflage pattern. Those who have completed high school will enter a special thirteen-week basic training in the Army as warrant officers, then attend the military officer school for five years (normally in Brussels, Belgium), before becoming a lieutenant in the Luxembourg Army. Aspiring officers are sent to the Belgian École Royale Militaire in Brussels, or the Ecole Spéciale Militaire de Saint-Cyr in France. After the first two years at these schools, officer-cadets receive the title of lieutenant. After leaving military academy, officer candidates become probationary officers for a period of twenty-four months. The probation period consists of specialised military-branch training at a school abroad, and practical service within one of the Army's units. If they succeed during this probation, their appointment as lieutenants is made permanent. Those who have completed five years of high school and have served four months as voluntary soldiers, will do a nine-month stage at the Infantry Training Department of the Belgian Army in Arlon, before becoming sergeants in the Luxembourg Army. Those who haven't completed five years of high school may, after three years of service, become career corporals in the Luxembourg Army, if they pass physical and mental tests. They also have to pass a part of the NCO School in Belgium. Luxembourgish HMMWV on national day. Luxembourg has a small and capable air wing. All NATO AWACS planes are registered to the LAF and sport the Luxembourg Army roundel. ^ "Defence Expenditures of NATO Countries (1990-2011)" (PDF). Archived (PDF) from the original on 2013-05-12. Retrieved 2013-05-01. ^ "La Milice (1817-1841)" [The Militia (1817-1841)]. Lëtzebuerger Arméi (in French). Armée luxembourgeoise. 2017. Archived from the original on 5 January 2017. Retrieved 10 March 2017. ^ a b "Le Contingent Fédéral (1841-1867)" [The Federal Contingent (1841-1867)]. Lëtzebuerger Arméi (in French). Armée luxembourgeoise. 2017. Archived from the original on 5 January 2017. Retrieved 10 March 2017. ^ "Le Corps de Chasseurs Luxembourgeois (1867-1881)" [The Light Infantry of Luxembourg (1867-1881)]. Lëtzebuerger Arméi (in French). Armée luxembourgeoise. 2017. Archived from the original on 5 January 2017. Retrieved 10 March 2017. ^ "Le Corps des Gendarmes et Volontaires (1881-1944)" [The Corps of Gendarmes and Volunteers (1881-1944)]. Lëtzebuerger Arméi (in French). Armée luxembourgeoise. 2017. Archived from the original on 5 January 2017. Retrieved 11 March 2017. ^ a b c "Les luxembourgeois de la "Brigade PIRON"" [The Luxembourgers of the "PIRON Brigade"]. Lëtzebuerger Arméi (in French). Armée luxembourgeoise. 2017. Archived from the original on 5 January 2017. Retrieved 11 March 2017. ^ a b c d e Trausch, Gilbert (1992). Histoire du Luxembourg. Hatier. p. 186. ISBN 2-218-03855-2. ^ "Mémorial A, 1967, No. 43" (PDF) (in French). Service central de législation. Archived (PDF) from the original on 13 October 2006. Retrieved 11 September 2006. ^ "Luxembourg Defence Information - Luxembourg Armed Forces - Luxembourg Army - European Defence Information". www.armedforces.co.uk. Archived from the original on 2016-09-22. Retrieved 2016-11-30. ^ "Service de Reconversion". Armee.lu. Armée luxembourgeoise. Archived from the original on July 14, 2014. ^ a b c "Officiers de carrière: Engagement – Formation – Nomination". Armee.lu. Armée luxembourgeoise / Gouvernment du Grand-Duché de Luxembourg. Archived from the original on July 14, 2014. ^ a b c d e f g "Armement" [Armament]. Lëtzebuerger Arméi (in French). Armée luxembourgeoise. 2019. Archived from the original on 29 January 2019. Retrieved 20 January 2019. ^ a b c d "Peace Research Institute". Stockholm International Peace Research Institute. 2017. Archived from the original on 14 April 2010. Retrieved 30 January 2018. ^ "World Air Forces 2015 pg. 24". Flightglobal Insight. 2015. Archived from the original on 24 March 2015. Retrieved 2 October 2015. ^ Pittaway, Nigel (September 2018). "Two H145Ms for Luxembourg Defence". Air International. Vol. 95 no. 3. p. 14. ISSN 0306-5634. ^ Robertson, Bruce (1967). Aircraft Markings of the World 1912-1967. Letchworth, Hertfordshire, England: Harleyford Publications. p. 65. ^ "Info on retired Luxembourg Army Aviation aircraft (Piper Super Cubs) active during the 1950s and 1960s". 11 January 2013. Archived from the original on 23 May 2012. Retrieved 11 January 2013. Wikimedia Commons has media related to Military of Luxembourg. The Army of the Republic of Macedonia is a defense force consisting of an army and air force. It is responsible for defending the sovereignty and territorial integrity of North Macedonia. Since 2005, the Army is a fully professional defense force compatible with NATO standards. A company is a military unit, typically consisting of 80–150 soldiers and usually commanded by a major or a captain. Most companies are formed of three to six platoons, although the exact number may vary by country, unit type, and structure. The German Army is the land component of the armed forces of Germany. The present-day German Army was founded in 1955 as part of the newly formed West German Bundeswehr together with the Marine and the Luftwaffe. As of 28 February 2019, the German Army had a strength of 62,194 soldiers. The French Army, officially the Ground Army to distinguish it from the French Air Force, Armée de l'Air or Air Army, is the land-based and largest component of the French Armed Forces. It is responsible to the Government of France, along with the other four components of the Armed Forces. The current Chief of Staff of the French Army (CEMAT) is General Jean-Pierre Bosser, a direct subordinate of the Chief of the Defence Staff (CEMA). General Bosser is also responsible, in part, to the Ministry of the Armed Forces for organization, preparation, use of forces, as well as planning and programming, equipment and Army future acquisitions. For active service, Army units are placed under the authority of the Chief of the Defence Staff (CEMA), who is responsible to the President of France for planning for, and use, of forces. The Force Publique was a gendarmerie and military force in what is now the Democratic Republic of the Congo from 1885, through the period of Belgian colonial rule. After independence, the FP was retitled as the Congolese National Army or ANC. The United States Army Airborne School – widely known as Jump School – conducts the basic paratrooper training for the United States armed forces. It is operated by the 1st Battalion (Airborne), 507th Infantry, United States Army Infantry School, Fort Benning, Georgia. The Airborne School conducts the Basic Airborne Course, which is open to troops of both genders from all branches of the United States Department of Defense, Reserve Officer Training Corps, and allied military personnel. All students must volunteer to attend the course. The French Revolutionary Army was the French force that fought the French Revolutionary Wars from 1792 to 1802. These armies were characterised by their revolutionary fervour, their poor equipment and their great numbers. Although they experienced early disastrous defeats, the revolutionary armies successfully expelled foreign forces from French soil and then overran many neighboring countries, establishing client republics. Leading generals included Jourdan, Bonaparte, Masséna and Moreau. The Armed Forces of Montenegro consists of an army, navy and air force. There has been no conscription in Montenegro; the military is a fully professional standing army. The Lithuanian Land Forces (LLF) form the backbone of the country's defence force, capable of acting as an integral part of NATO forces. Lithuanian Land Forces consist of three brigades, the Engineer Battalion, and the National Defence Volunteers Division. The 197th Infantry Brigade is an inactive Infantry brigade of the United States Army. The brigade was active as an Organized Reserve unit from 1921–1942, in the Regular Army from 1962–1991, and as a TRADOC training unit from 2007–2013. The brigade saw service in Operation Desert Storm with the 24th Infantry Division. A squadron was historically a cavalry subunit, a company-sized military formation. The term is still used to refer to modern cavalry units but can also be used as a designation for other arms and services. In some countries, like Italy, the battalion-level cavalry unit is called "Squadron Group". The Battle of Haktang-Ni was a skirmish in the Korean War fought between a largely Belgian United Nations (UN) contingent and Communist Chinese People's Volunteers between 9–13 October 1951, just north of the city of Chorwon just over the North Korean border. The 3rd Parachute Battalion is a military formation of the Belgian Army and part of the Paracommando Regiment. It carries on the regimental traditions of the Belgian Korean War volunteers. The German invasion of Luxembourg was part of Case Yellow, the German invasion of the Low Countries and France during World War II. The battle began on 10 May 1940 and lasted just one day. Facing only light resistance, German troops quickly occupied Luxembourg. The Luxembourgish government, and Grand Duchess Charlotte, managed to escape the country and a government-in-exile was created in London. Émile Speller was a Luxembourgish military officer and the commander of the Corps des Gendarmes et Volontaires during the German invasion of Luxembourg in World War II. He also served as aide-de-camp to several members of the Grand Ducal Family throughout his career and chamberlain of the Grand Ducal court.